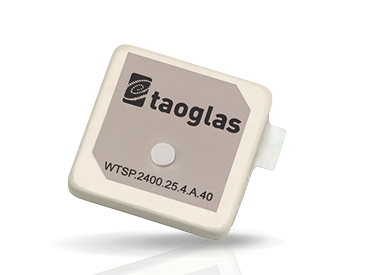 Taoglas has launched its new Terrablast antenna series. The antenna line features polymer-based patch antennas that are 30% lighter than ceramic antennas, making them extremely impact resistant. The antennas are perfect for UAV/Drone and automotive applications where antennas must be rugged, but still perform. The first antennas in the Terrablast range are a 25mm embedded 2.4 GHz patch antenna and a 35mm embedded GPS patch antenna. The circular polarised design of the 2.4GHz patch ensures maximum performance for constantly moving mobile applications where the orientation to the transmitter or receiver frequently changes. The antenna weighs just 5.6g compared to an equivalent ceramic patch of 8.5g, making it an ideal weight-saving substitute for ceramic patches in UAV applications. The 35mm GPS/GLONASS/BeiDou patch antenna has extremely high efficiency of over 70% across all bands, improving time to first fix (TTFX). At just 10g, the 3.5mm-thick patch is 5.5g lighter than typical ceramic GNSS patches.